We’d love your help. 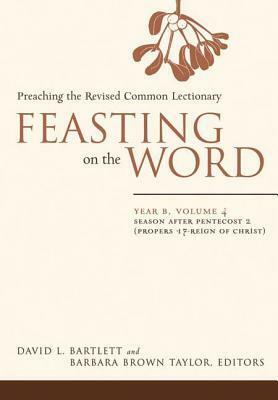 Let us know what’s wrong with this preview of Feasting on the Word by David L. Bartlett. With this new lectionary commentary series, Westminster John Knox offers the most extensive resource for preaching on the market today. When complete, the twelve volumes of the series will cover all the Sundays in the three-year lectionary cycle, along with movable occasions, such as Christmas Day, Epiphany, Holy Week, and All Saints' Day. For each lectionary text, preacher With this new lectionary commentary series, Westminster John Knox offers the most extensive resource for preaching on the market today. When complete, the twelve volumes of the series will cover all the Sundays in the three-year lectionary cycle, along with movable occasions, such as Christmas Day, Epiphany, Holy Week, and All Saints' Day. For each lectionary text, preachers will find four brief essays--one each on the theological, pastoral, exegetical, and homiletical challenges of the text. This gives preachers sixteen different approaches to the proclaimation of the Word on any given occasion. To ask other readers questions about Feasting on the Word, please sign up. This was not worth the purchase. Buy good commentaries and read those instead.